–if you take vitamin C tablets and crush them into powder, put them into some dandruff shampoo or clarifying shampoo, leave it on your head for an hour – it will totally strip away about 3 shades of color. Now, I’ve been struggling with getting my hair back to a more natural shade since January. I gave myself a very bad dye job, then started seeing a great stylist, who has been working me back to normal. I have been getting a partial foil of highlights from the crown forward, and doing a rinse over bottom back of my hair to hide the red. But as the rinse wears out, I end up with forty different shades of hair, and it’s not nice. I have an appointment this coming Saturday, so if I was going to try anything that would potentially do horrible things to my color, now was the time. That’s Chad, my new beauty guru, at the bottom there. 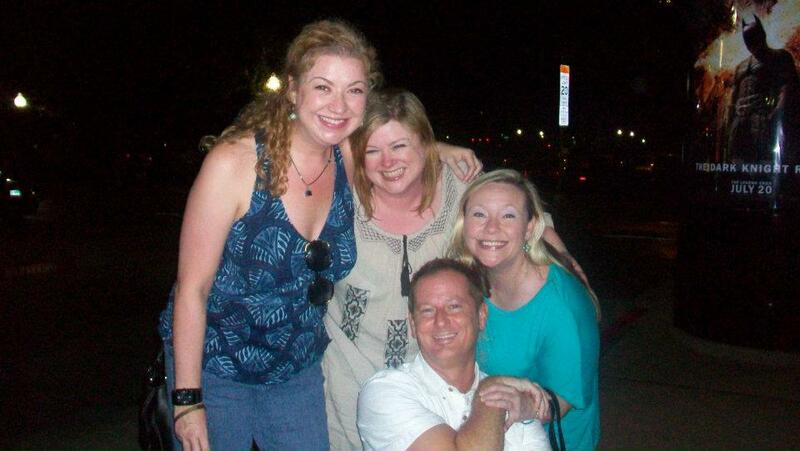 I am in the middle of a gorgeous Kimmie/Kerri sandwich. I have such awesome friends! And good looking. I also have a huge hunk of spinach in my teeth. Gross. I grabbed some Selsun Blue and Vitamin C while I was at the grocery store. Now, I could only find chewable Vitamin Cs, and I wasn’t sure how many to use, so I chewed up about 4 of them, and I think about 2.5 of those made it into the shampoo mixture. Yes, I am just that gross. Anyway, I put the mixture on my head while I worked on making sweet potato chips (epic failure for looks, but omg so good!) and washed it off a little while ago using my regular shampoo and conditioner. It worked! My highlights are as bright as their first day, the bottom back of my hair has stripped down to one chestnut shade (which is quite nice), and my hair feels like silk. That last part is my favorite. It’s been feeling stiff and yucky lately, so this is a very nice change!